Ben Jordan is called out to the small California town of Dunesberg to investigate a man's disappearance while searching for the Lost Galleon - a legendary treasure ship said to be buried out in the middle of the desert. 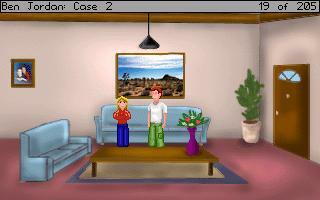 "Debatably the weakest game in the series, this case is short and lacks the punch of the later entries. In spite of this it's still a game not to be missed for fans of the series and purists." Though it was particularly long and enjoyable, It wasn't as fun as games 4 and on. Game 3 wasn't so fun either, but that's another story. -Certain puzzles were simple, yet enjoyable and did most at once. -Someone nailed Starbucks's evils on the head! Woohoo! -It was much funnier than the game 1, and a little less gory! - You got some pretty easy puzzles... actually all of them are. - The villain was... ehh, not bad, I guess. - After Case 1 Deluxe and Case 7, not hearing Ben Jordan is... well... what's the smiley face doing the raspberry? Nevermind. - Add a few more people/puzzles and make it a paranormal MYSTERY instead of a missing person's hunt. -Make a patch or add-on to remove some of these problems. I hope you read and reply to this comment, thank you. - The backgrounds were just okay. - The dialog was just okay. - The puzzles were WAY too easy, save one or two VERY obscure ones. It was a decent, medium length adventure. I enjoyed it, but not as much as, say, the first. In any case, I've seen what you can do, so I'm interested in seeing the series continue to thrive! I went from the Deluxe Ben J1 to this so it might be considered a downgrade. I didnt like the graphics but I did like the interesting characters. I keep hearing that the series gets way better, since the series is ok so far, I cant wait to see where it goes. Looking at this game, I definitely think Grundislav should make a deluxe version of it, it would be well worth it. Adding more challenges along the way, especially in the last part itself, would be a great experience. Pros: More in-depth characters, humor, interesting puzzles, music is in sync with environment. Cons: Last part could be longer, town could have more buildings (such as houses, inaccessible). The graphics critique themselves, so I don't need to post on that. The puzzles were unique, yet logical. Overall an average game. You should play it for sake of the series (which gets a LOT better), if for no other reason. It was a great game when I first played it, however reaching Case 6 with a deluxe remake, now makes it seem the least of the series. A remake has the potential to enhance it in so many ways. The 2nd case doesn't get much better in my liking. Still a lot of running around the city doing stuff for people and an unsatisfactory story at the end that didn't do it for me. This is an okay game. It isn't gory like Ben Jordan 1. But it isn't scary either. Which is rather sad since this game concerns the supernatural. The puzzles are pretty decent, though silly at times (the dive helmet for example). The characters are interesting. Odd, but interesting. The graphics are decent. The story could be better. The villain is, sadly, unimpressive. Ben Jordan 2 is worth playing but the series gets much better with the fantastic Ben Jordan 3. So far I've played BJ1 deluxe and this one. Both are very good games, recommended to everybody. It was quite an amazing game. Not to long or short. Not too hard or easy. Everything was perfect! Great game! I enjoyed it a lot. Great follow up to the first game. I love the theme. The music on this game is awesome. This is a pretty nice game with nice graphics and a great music score. The characters are well developed and you really get the feeling that you learn to know most of them. I haven't played part 3 yet but I hope it has fixed a couple of issues I had with this game. First of all I sometimes clicked past a couple of hints given by people you talk to, and talking with them again didn't repeat the hints. Neither where they noted in the notebook. Why have a notebook if only the first couple of tasks are written in it. I also found it strange that the old man that didn't want to help at first before you brought him something suddenly was very helpful without you giving him that thing once you've got it. The coffee also seemed to be somewhat of a red herring since I couldn't find any use for it. Overall it's a good game and I enjoyed it very much. I will now go and play part 3. This one is with out doupt better that the first one. The art seems to be better than the first one, or I am getting used to that blurstyle. The music is superb. However, [SPOILER? ]it didnt have that 'must hurry!' moment which was the highlight of the first one[/SPOILER]. Overall a enjoying gaming experience. The sequel to the classic short game, Ben Jordan 2 is a longer adventure which retains the charm and much of the magic of its predecessor. I adored Ben Jordan 1 with all my heart so Ben Jordan 2 had a lot to live up to. First, then, the inevitable negatives. The second Ben Jordan game did not quite have the same level of atmospheric involvement as the first (I didn't really feel I was there with Ben like I did when he sat round the campfire with Ranger Rick) but nevertheless still retains the delightful, gentle nostalgic feel of a Saturday morning cartoon. The only other gripe I have is one daft moment in the introduction when Ben steps out of a shower fully clothed! Apart from those incredibly minor nitpicks Ben Jordan 2 is a great game. Another range of colourful characters (SPOILER: the cameo by a certain Medicine Man is very funny SPOILER END), puzzles that aren't too hard but aren't childsplay either and the same standard of great dialogue as the first. There's a scathing satire on Starbucks in there that stans out for me. Two things that I forgot to mention on my review of the first Ben Jordan game. One is the refreshing way you hold a conversation, being presented with just the key words of the topic you wish to discuss rather than the whole sentence you're about to say. Highly original. More prominent, however, is the wonderful music. I forgot to mention how great the music in Ben Jordan 1 was but the music in Ben Jordan 2 is even better. A range of different music for each setting, best of all being the tune playing in the bar-room scenes. The music really helps build the atmosphere but is never intrusive. Ben Jordan 2, then, while not as fully rounded as the first one, is still an excellent and utterly charming game. Fans of Ben's first case will no doubt be very pleased to be back in his company for a longer amount of time. If you loved the Skunk Ape, you'll love the Lost Galleon. Good game. Got stuck a few times but this is not negative, it brings a challenge in the game.